Melissa, mother of toddler Archie, has been coming to St Nicholas Early Education Chisholm with her son for six months. 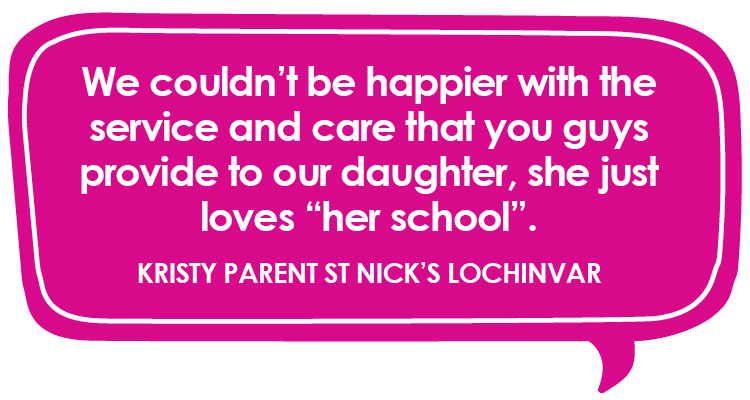 She found childcare difficult at first because her son was exclusively breastfed and reluctant to drink from a bottle, but the educators at St Nick’s made her feel supported and comfortable in coming in to breastfeed when necessary. “The girls here were so supportive of letting me come in and breastfeed. They made me feel really comfortable. They also helped transition [Archie] into taking a bottle in the days he was here, which was such a relief,” Melissa says of the support she received upon starting her child at St Nicholas Chisholm. Melissa also appreciated how collaborative the learning environment is at St Nick’s, for both her and her son. In respecting the individual beliefs, values and philosophies of all of our families, St Nicholas endeavours to create an environment that encourages active participation in learning programs to create a sense of belonging to the St Nicholas community. “They wanted as much information about our home routine as possible so they could then mimic that at school,” Melissa says of the inclusive and considerate nature of St Nicholas educators. Another thing that appealed to Melissa was St Nick’s all-ages playground, which encourages children of all different ages and background to play and learn from one another in a safe and monitored environment. “[The older kids] make [Archie] feel really welcome. You might think that the older kids might be tripping over the younger ones, but they don’t. They include them in the games, they look out for them and it’s really creating a sense of community within the playground,” Melissa says of the mixed-ages playground at St Nicholas Chisholm. Melissa also appreciates St Nicholas’ Transition to School program because it’s preparing her children for their advancement to primary education. St Nick’s Transition to School program is designed to build a child’s confidence and resilience in order to give them a positive start to their next stage of schooling. “As Archie transitions through to the preschool room, he will then go to St Aloysius Primary School with all of his friends that he’s made,” Melissa says of the program. St Nicholas Early Education is currently taking enrolments for 2019. Contact us here for more information.